Therapist Lori Gottlieb's memoir of the personal crisis she faced that led her to go back into therapy is a gripping read. 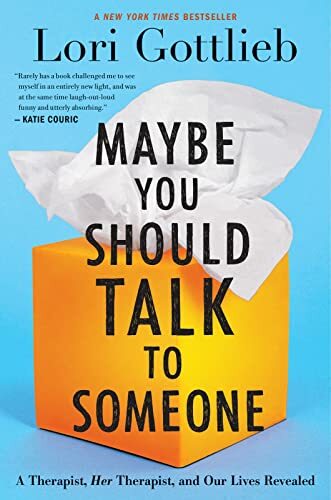 She recounts both her own experience as a therapist with some striking patients, and her finding a new therapist for herself after her boyfriend broke off their engagement. The chapters are pretty short and the writing is vivid. Gottlieb questions her own methods and assumptions, and examines the constraints of the role of therapists, and comes to grow through both her patients and her own psychotherapy practice. Gottlieb previously published a memoir of her own anorexia, in Stick Figure, published back in 2000. In the early chapters of this book, she tells how she started out first in TV, then medical school and finally to train as a therapist. Now that she is a therapist working in California, she has a wide range of clients. The most memorable is John, who works in the TV business, and comes in because of marital problems. He comes in to therapy telling Gottlieb what to do, he orders his lunch to be delivered, and he answers calls during his session. He is totally obnoxious. She manages to engage him in dialog and gradually enable him to pay attention to her and open up in the therapy. Eventually, John finally tells about a major loss he experienced and they start to get somewhere. By the end of the book, we see John as a resourceful and vulnerable man who has dealt with terrible suffering. Gottlieb shows his humanity, but also shows how their interactions are often funny -- like the time when he was texting during their session so she texted him. Her other clients are also memorable and she tells great stories about their sessions -- often moving and insightful. Julie is a client who is dying, and comes to Gottlieb to help her come to terms with that. Julie decides to take a job at Trader Joes, which her friends think is strange, but Gottlieb supports her, and it works out very well. She sees her client through to her end, and even attends her wake. The question of what kinds of interactions with clients are appropriate comes up many times throughout the book. The boundaries of therapy come up especially with her own therapist, Wendell. She goes in wanting to complain about her ex-boyfriend, and Wendell lets her, but also pushes her to realize there are bigger issues. They come to explore other parts of Gottlieb's life, including some illness she is dealing with. At one point, they dance together during the therapy session, in one of the most unconventional moments in the book. Gottlieb reflects on how some therapists would not approve, but she found it a valuable experience. Having read a good many tales of therapy, it is great to find one that is fresh and interesting. Recommended.